Just minutes after securing his fifth Champions League as a player, the sound of Cristiano Ronaldo discussing his time with Real Madrid in the past tense was a rather bizarre one, yet there are many intricacies involved in the case of his situation with Los Blancos. For all the speculation that this may finally be the summer where the relationship between the Portuguese forward and the club fractures beyond repair, all factors point towards Florentino Perez and Real Madrid being in a strong position. Firstly, there is the 1 billion euro buyout clause in the former Manchester United forward’s contract, an incredibly prohibitive figure that will never be met. Furthermore, there have already been negotiations going on behind the scenes to tie Ronaldo down to a new contract at the Estadio Santiago Bernabeu, his current deal is currently set to end in June 2021. Prior to the beginning of May, agent Jorge Mendes met with the club’s chief executive, Jose Angel Sanchez, and the details of an improved deal were discussed. These figures are understood to range between 30m and 33m euros, and this could be a world record contract once all further bonus payments are taken into account including winning the Champions League and the Ballon d’Or. Clearly, an agreement hasn’t yet been reached, but it seemed as though negotiations were well on track ahead of the Champions League final in Kiev. This entire matter began exactly one year ago, shortly after winning the Champions League final in Cardiff on June 3, 2017. Perez promised the Portuguese international a renewal of his contract to improve his 23m euro net annual salary, despite the fact that contract had only been signed in November 2016. Yet, by June 16, there had already been the first signs of a departure in closeness between both parties with A Bola reporting that the forward wanted to leave Los Blancos, a rumour he never denied. The summer of 2017 was one which changed the finances of football for the foreseeable future with Neymar’s transfer to Paris Saint-Germain seeing him earn a contract of 37m euros per year in salary alone. Lionel Messi’s renewal with Barcelona was a protracted affair, but eventually the Argentine agreed a deal which paid him around 33m euros in salary, both of these contracts left Ronaldo’s looking rather outdated for a player who had won the 2016 Ballon d’Or. A crisis occurred in September of 2017 with Real Madrid beginning their domestic campaign in a disappointing manner, despite the fact they won both the Supercopa de Espana and UEFA Super Cup. Something was amiss with Ronaldo and his performances on the pitch declined sharply, it was clear that those in power at the club were even beginning to think that his age was finally becoming a factor. All movement with regards to the aforementioned promise of a new contract ground to a halt, whilst rumours of a sensational bid for Neymar began to emerge. This caused the player to feel betrayed, he went away and made the decision that he would force his exit from the club at the end of the 2017/18 season. What made the links to the former Blaugrana forward worse for the former Sporting CP prodigy was the fact that it was claimed the European champions would offer him the salary which he’d been previous denied. He was reportedly incredulous that Neymar could be offered such a contract, when after everything he’d done for the club, he wasn’t granted his wish. This was seen as a further lack of respect and a distance grew between the board at Real Madrid and Ronaldo’s camp, the 33-year-old felt as if those within the club were simply waiting for him to decline. His form following the winter break then changed things, he was sensational and put the team on his back with goals in the Champions League and LaLiga. It was the very best Ronaldo and he ended the season with 44 goals in 44 matches, scoring crucial goals against Paris Saint-Germain and Juventus, he showed he was still essential despite his advancing years. By the time mid-April arrived, it was decided that the player had done enough to earn a new contract and talks were opened, although Los Blancos continued to privately court Neymar as their priority. An individual with the personal pride of the multiple Ballon d’Or winner was clearly still livid by his perceived negative treatment, he rejected the first contract offer out of hand and said the matter would be reviewed once the season has ended. This leads us to where we are now on May 27, the threatening message sent by Ronaldo on the pitch at the Olympic Stadium after he failed to emerge as the key figure in another Real Madrid triumph. In truth, he was on the periphery. Now the aim is to minimise the feeling of conflict, both sides have been here before, so much so that the world has stopped taking notice. 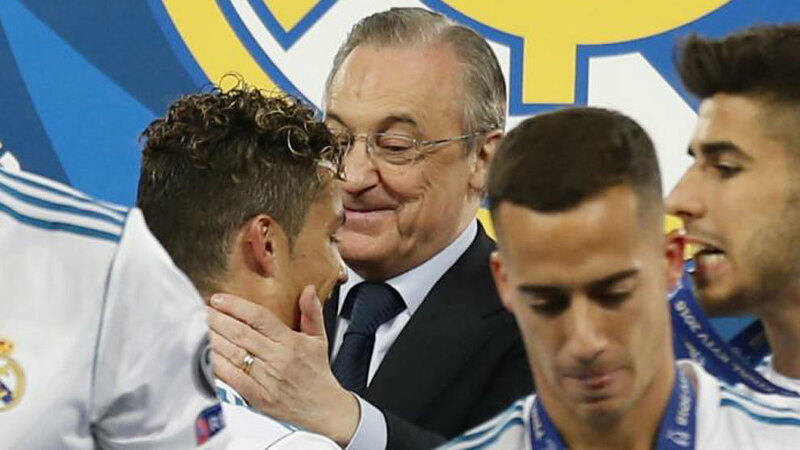 Perez and Ronaldo are destined to reach an agreement, simply because they are the two figureheads of a golden age at the Estadio Santiago Bernabeu, one which hasn’t been seen since the 1950s and early 1960s. Despite the irritation felt by his teammates, this message from the club’s leading scorer was calculated. However, he has a right to speak, although just like in September 2012, Ronaldo will receive his new contract and the club will work to appease his bruised ego, simply to continue the relationship.